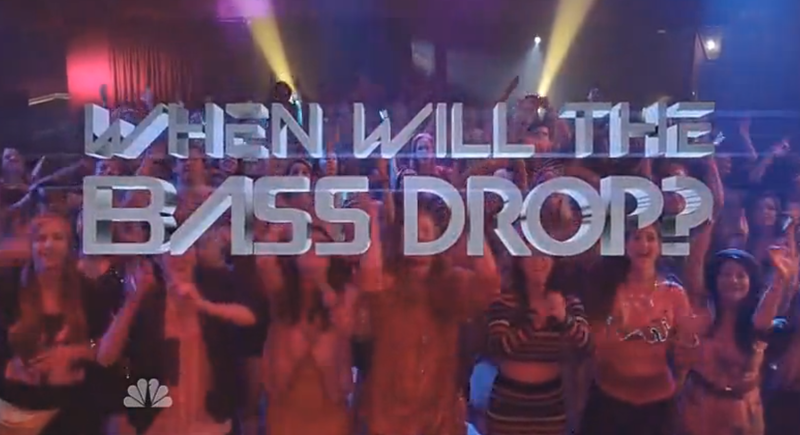 By now, the majority of daily Internet users have either watched or at least read about this weekend’s “When Will the Bass Drop?” sketch on Saturday Night Live’s season finale. The sketch, an SNL Digital Short created by former cast member and returning host Andy Samberg, easily became one of the night’s highlights, with Samberg taking the stage at what appears to be a mock main stage setup of a major music festival, such as Ultra, EDC Las Vegas, or even Coachella. Samberg, under the alias DAVVINCI (David Guetta + Avicii = Da Vinci, quite punny), ‘plays’ a DJ set to fans, but he actually does anything but. He pokes fun at DJ’s who don’t really do much performing during their live sets by frying eggs in a pan and almost dying, among other things, and when it finally comes time to drop the bass, a mock “That was easy!” button from Staples labelled Bass is at his service. To top it all off, the ravers in the crowd, played by various cast members, are overly eager, roasting ravers who openly admit they’re having the best day of their lives (I’m guilty as charged). The reactions this skit has caused are pretty interesting. Saturday Night Live makes fun of everything, including people from all walks of life, so it is pretty easy to take a joke and laugh it off. It was funny to see a major TV show roasting the EDM scene and just acknowledging the music scene in general. Positive reviews of the sketch have come from EDM fans who are ready for the scene to grow and develop away from the mediocre tendencies that the skit is making fun of. Non-EDM fans have also left positive reviews, but that may be because they don’t like the culture of the scene (thumbs down Emoji). Interestingly enough, both EDM fans and non-EDM fans alike have had negative reviews on the skit as well. EDM fans have said the sketch was insulting because while the goal was to target certain DJ’s who get lazy, the entire genre of music takes a hit from mainstream media who put it on blast far too much to begin with. Non-EDM fans who had similar reactions mostly criticized SNL for the lack of relevance for the skit to the interests of the show’s demographic. So what does this all mean? It’s been a vicious cycle. The 1930s: Jazz isn’t real music. The 1950s-present: Country isn’t real music. The 1960s: Rock isn’t real music. The 1980/90s: Hip-hop isn’t real music. The 2000s: Bubblegum pop isn’t real music. The 2010s: EDM isn’t real music? So, what is real music? If you take a look at Saturday Night Live’s musical guests this past season, it’s no secret they have leaned towards obscure (but very talented) indie alternative artists, such as St. Vincent and Arcade Fire, a sharp turn from the Top 40-esque guests of recent seasons. Keeping this in mind, it is understandable why this sketch may be a downright insult to dance music fans. When was the last time Fatboy Slim or Carl Cox performed on the show? This is an open suggestion. Your move, SNL. Regardless, hopefully this generational “that’s not real music” hypocrisy will be put to an end someday. Unfortunately, this wasn’t the only questionable part of the skit for me. “Get turned up to death”… was this a double entendre? Yes, Lil Jon, we all have heard that DJ Snake song way too many times. We know what happens when the bass drops. But the exploding bloody heads in the skit? Maybe I just get queasy easily, but I thought that was a tad over-the-top. I was curious if they were trying to make fun of people who have died at these events (especially with Electric Zoo being in New York City, where SNL takes place), considering the phrase “get turned up to death” was quite literally what happened in that situation. The optimist in me would like to think I am reading in to this way too much, but that was my initial reaction upon watching the sketch as it aired for the first time. I’m curious if other people feel the same way. Despite some of my curiosities and critiques of the sketch as a fan of the genre, I am also a big fan of the show and have a large enough funny bone to see this as a roast, not an insult, and to see the obvious intention: to address those lazy DJ’s out there! But non-EDM fans, please don’t generalize. There are many, many DJ’s who perform sets live rather than pre-record, whether the instrument for that live element be a CDJ, classic vinyl, or completely digital software. There might not be a lot happening visually on the decks, but there is so much going on mentally to ultimately provide the best set for the crowd. (And let’s be honest, with the music, stage visuals, and festival crowd being exhilarating already, is there a need for DJ’s to learn intense choreography or perform the ‘Cups’ song from Pitch Perfect while they mix?) To be fair, I do get hungry at raves though, so if DAVVINCI wants to drop in and cook me up some scrambled eggs, I’m always down! I am definitely open to other reviews on the sketch. As a big dance music fan, what was your reaction to the skit? Did you laugh at Samberg’s DJing antics, yell at your TV insulted, or proudly admit that would be you saying it was the time of your life? It’s okay Bobby Moynihan, you’re not alone… wanna trade Kandi with me?